Political leaders in Britain's Labour Party have been informed by legal counsel that their party's leader, Jeremy Corbyn, could be hit with U.S. sanctions for his multiple dealings with the terror group Hamas, according to a copy of a U.K. legal review obtained by the Washington Free Beacon. 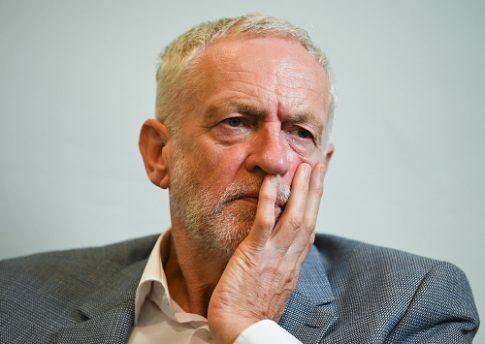 Corbyn, who has long come under fire for his anti-Semitic and anti-Israel remarks, could be slapped with American sanctions for providing material support to Hamas, a designation that could result in the leader's financial assets being frozen, among other penalties, according to a legal brief commissioned by members of the Labour Party who are said to be concerned about Corbyn's radical ties. The legal review, performed by W Legal, paints a compelling case against Corbyn, who has been open about his multiple meetings with Hamas and other prominent anti-Israel forces. Since rising as Labour's leader, Corbyn has come under fierce criticism for his radical ties and history of making anti-Semitic remarks. The legal review is likely to provide further grist to Corbyn's opponents and possibly spark an investigation by U.S. officials overseeing sanctions policies in the Trump administration. "In circumstances where grounds exist upon which Jeremy Corbyn may become subject to U.S. sanctions, many people may conclude that the Labour Party lacks credibility," Nigel Kushner, chief executive of W Legal, said in comments accompanying the firm's review, which has not before been publicly reported. "I anticipate a push in certain quarters on both sides of the pond for Jeremy Corbyn to be made the subject of U.S. sanctions. There is a view that enough is enough." The four-page legal review builds a compelling case against Corbyn, alleging that his relationship with Hamas officials could be viewed as material support to the group, an offense subject to sanctions under U.S. laws. "Hamas is listed on a U.S. sanctions list. Anyone deemed ‘otherwise associated' with someone on the list is themselves at risk of being put on that sanctions list," the review argues. "In our view, the reported references made by Jeremy Corbyn concerning Hamas and Hamas persons and his dealings with them may be construed by the relevant U.S. authorities as tantamount to him being ‘otherwise associated' with Hamas and might thereby result in relevant U.S. authorities determining he should be designated," according to the legal memorandum. U.S. authorities are likely to look at "the frequency with which Jeremy Corbyn has historically met and/or shared platforms with Hamas," lawyers claims. Other evidence that could be reviewed includes Corbyn's multiple investigations to meet with Hamas and his references to them as "friends" and "brothers." Corbyn has been open about his support for and associations with Hamas and officials tied to the group. He has shared the stage with top Hamas terrorists in the past and has attended events openly critical of Israel and Jews, according to multiple reports dating back as far as 2009. This activity is punishable under U.S. law and could be used by the Trump administration to sanction Corbyn, the legal review maintains. If hit with sanctions, Corbyn could have his assets in the United States blocked and be prevented from using U.S. banks to process transactions, according to the review. This could impact his finances in the U.K., where many banks rely on U.S. institutions to enable transactions. "In practice, in our experience, many high street banks in the UK would be unwilling to process electronic payments to or from Jeremy Corbyn—even if permitted to do so," according to the review. "Such would place the bank at risk of becoming subject to a penalty if the payment involved a U.S. clearing or correspondent bank; and would place the bank at risk of itself being designated if it processed payments to or from Jeremy Corbyn—even if such did not involve a U.S. bank or U.S. person or an electronic payment in U.S. Dollars." It is also possible "that most UK banks would consider going further and might refuse to process payments to and from the Labour Party itself whilst a designated person was leader," according to the memo. The State Department would not comment on the review or the possibility of sanctions. This entry was posted in National Security and tagged Hamas, United Kingdom. Bookmark the permalink.